For the next month, Indonesia will be hosting Asia’s biggest sporting event, the 2018 Asian Games. The multi-sport event is scheduled to be held from 18 August to 2 September. 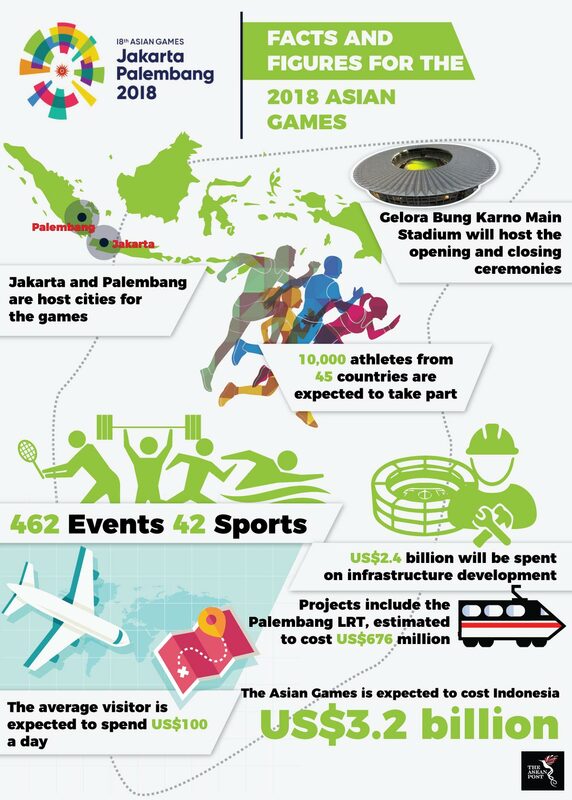 This is the first time the Asian games will be hosted in two cities, Jakarta and Palembang. This is also Indonesia’s first time hosting the games since 1962. Ever since it was selected as host for the games, Indonesia has spent massive amounts of money on new sporting venues, upgrading existing sports infrastructures, and building other infrastructure to support the games. According to Indonesia’s National Development Planning Agency (Bappenas) a total of US$2.4 billion has been spent on infrastructure development surrounding the 2018 Asian games. In fact, it was the high cost associated with hosting the games that made Indonesia the host for this year’s event. In 2012, Hanoi, Vietnam was selected as host city. Hanoi won the bid after gaining 29 votes against Surabaya’s 14. Then two years later in April 2014, Vietnam officially announced its withdrawal from hosting the games. Then Vietnamese Prime Minister Nguyen Tan Dung said that Vietnam was unprepared and could not afford the construction of new facilities and infrastructure. Furthermore, former Chairman of the Vietnam Olympic Committee Ha Quang Du also claimed that hosting the Asian Games would not drive tourism up in Vietnam. Prior to the withdrawal, concerns were raised whether the US$150 million budget was viable. There were also reports that Vietnam would end up spending over US$300 million to prepare as host of the games. After Hanoi’s withdrawal, the Olympic Council of Asia selected Jakarta and Palembang as hosts for the games. Among the reasons Jakarta was chosen as host city was because it already had sports facilities, adequate transportation networks and lodging for guests and participants. With large amounts of money spent on the games, the question therein lies, is it worth it? While hosting international sporting events may raise the profile and prestige of the host country, it can be extremely costly to the economy. Rio de Janeiro is still facing the after effects of playing host to the Olympics in 2016. Venues and stadiums there have been reduced to white elephants while the people of the city are facing hard times due to the waning economy. Perhaps Vietnam made a wise choice by deciding against hosting the games. Bappenas claims that Indonesia will spend US$2.4 billion on infrastructure for the games, but the Asian Games as a whole is expected to cost the Indonesian economy up to US$3.2 billion. Among the infrastructure projects for the games is the light rail transit (LRT) system connecting Palembang airport to the Jakabaring Stadium Complex. The LRT rail system is said to cost US$676 million. In addition to that, 15 venues have been renovated to prepare for the games including the Gelora Bung Karno Main Stadium that will host the opening and closing ceremonies. Indonesia has also constructed the biggest equestrian facility in the region for the games. The Indonesian government expects these expenses to pay off when visitors and tourists come to the country to attend the games. It is expected that the 2018 Asian Games will bring visitors to Indonesia who will spend up to a total of US$245 million. However, whether all these investments will bring any benefits in the long-run to the people of Indonesia remains to be seen. There are also concerns whether the upgrades of all these venues will be fully utilized in the future. The large amount spent on the Asian Games also brings into question Indonesia’s fiscal sense. While the economy is growing, Indonesia is facing problems funding its other infrastructure projects. Jokowi has ambitious plans to develop the country’s infrastructure, and the government is targeting to spend US$45.7 billion from 2015 to 2019. Spending billions for the Asian Games could take away meaningful investment from other more important infrastructure projects. This article was first published by The ASEAN Post on 1 May, 2018 and has been updated to reflect the latest data.